Comprehensive review of Brazilian True Tan. See what real experts and actual users have to say about this self tanning product. Overall, I gave Brazilian True Tan 1.5 out of 5 stars, because there wasn’t really anything I liked about it. First, it comes out a funky looking green color. It has a dual applicator that is supposed to evenly pump out white self tanner, and a brown bronzer. But the pump didn’t evenly distribute it, so only a tiny bronzer came out, causing the murky color. Second, the smell is awful. Not to be mean, but it was really bad and reeked of DHA. Lastly, the product never dried, and I woke up the next morning with my skin still feeling wet. To top it off, I only had a very light tan and it was very scaly because the product seemed to have dried my skin out. I like that they tried to do something different by adding glycolic and AHA to the tanner, but it didn’t seem to work in my opinion. So, I wasn’t impressed with Brazilian True Tan, hence the 1.5 star rating. This is a thin lotion. It has a dual applicator, so white tanning lotion comes out one part and dark brown bronzing lotion comes out of the other. It doesn’t come out evenly distributed however… way more white tanning lotion came out than the bronzer. So I’d say the lotion doesn’t really have a guide in it because so little bronzer comes out. It ended up being a murky cream, green color, but it didn’t act as a guide on my skin. Application was very simple and easy. I didn’t even feel like I needed to use a tanning mitt, because there wasn’t a dark guide to worry about. 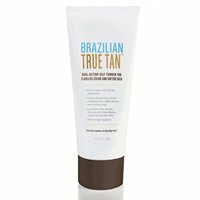 Brazilian True Tan goes on like your normal lotion, and it’s very easy to blend in and apply. This is the worst thing about this product….it never dried! This self tanner didn’t feel sticky when applied to the skin, but it felt very wet, like I was sweaty. And it stayed “wet” feeling all night long. When I woke up the next morning, my skin still felt wet! It was a very unpleasant feeling and I really didn’t like it. Brazilian True Tan smells like pure DHA. It smells like old school self tanners did before they used fragrance to cover up the DHA smell. As I’m writing this review, the product is in the box next to me and I can still smell it, it’s THAT strong. I didn’t smell any fragrance or other scents, just DHA. After the tan developed, I could still smell DHA. I couldn’t wait to shower this one off! I was left with a very light tan after one application. The box says you can use a few days in a row to deepen your tan, but I didn’t even try than because I didn’t like how my skin looked. My tan was light, but it was very scaly looking, I feel like the glycolic or AHA in this lotion dried my skin out. They claim this is a “dual action” self tanner. So it’s supposed to give you a tan while also giving you softer skin. They included AHA and a glycolic formula to help condition and exfoliate your skin, but all it did for me was dry my skin out. Also, I’d prefer to exfoliate before I self tan, rather than while I’m doing it. I was pretty disappointed in the tan I got from Brazilian True Tan. My light tan lasted around 3 days, at which point I was ready for it to come off. As it faded it looked scaly and dry. Brazilian True Tan is $3.25 per ounce, which isn’t a bad price tag, but I couldn’t justify buying this one again. To buy Brazilian True Tan, Click Here. Application Applying it was very easy and simple. Drying Time It never dried! Smell (Before) Smells strongly of DHA. Smell (After) I couldn’t still smell DHA the next morning. Color Produced I had a very light, scaley tan….and dried out skin! OK For Men? No, I don’t think they’ll like it at all. Price It’s $3.25 per ounce, which is reasonable, but I wouldn’t buy again.